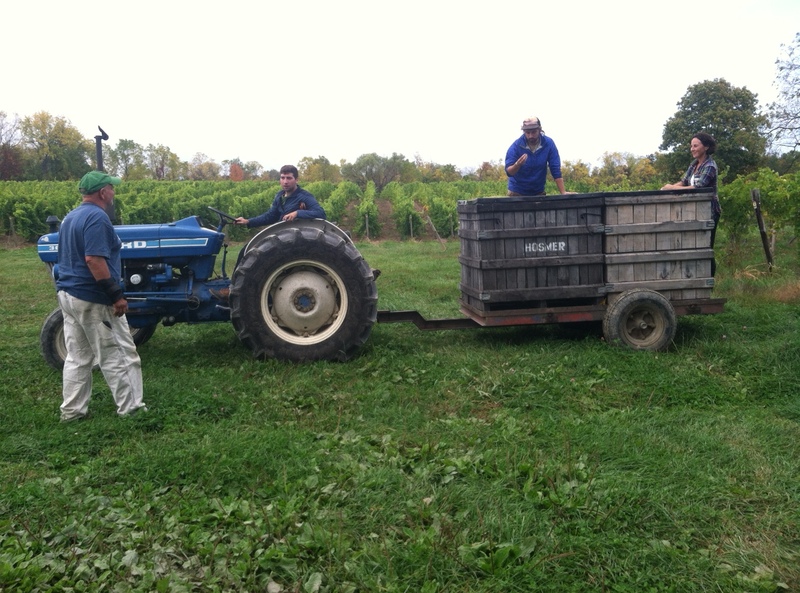 Harvesters at Hosmer Winery, in Ovid, New York, check out the Chardonnay grapes they harvested Thursday afternoon. With record-low temperatures throughout winter 2014, Finger Lakes wineries are now seeing a smaller yield of their product. However, ideal temperatures in September have led to a heightened quality of grapes this harvest season. Scott Osborn, president of Fox Run Vineyards in Penn Yan, New York, said he saw a 70 percent loss in his other grape varieties, but his Chardonnay grapes were saved by the balanced climate of the past month. Aaron Roisen, winemaker at Hosmer Winery in Ovid, New York, said even though there is a smaller crop, the winemaking process is being positively affected by the recent weather habits. Since Labor Day, wineries throughout the Finger Lakes have been reporting a smaller yield compared to last year. The 2013 harvest saw a record-setting season for New York State, bringing in 200,000 tons of grapes. According to Trezise, the 2014 harvest is below average. Hosmer’s greatest loss was in the Sauvignon Blanc variety. In 2013, the Hosmer’s harvested 18 tons of grapes from their vines, this year only one and a half. Hosmer said the damages throughout the Finger Lakes would be site specific. Trezise said location played a big part in the amount of winter injury the grapevines saw. Trezise said the eastern sides of the lakes receive more lake effect benefits and have longer exposure to warm air and sunshine. Most wineries suffered from “bud kill”, where the buds, or what become grape clusters, are killed due to the low temperatures. Trezise said this is much more manageable than when the grapevines die. Grapevines are a tough crop because they can withstand five to 10 below zero degrees Fahrenheit, Trezise said. The snow helped tremendously in insulating the vines, Hosmer added. Vincent Altiperi, owner and winemaker at Billsboro Winery in Geneva, New York, said he and his team are making changes to their harvest process. Altiperi said previous successful harvests will allow wineries to maintain their stock even if this year is less bountiful.